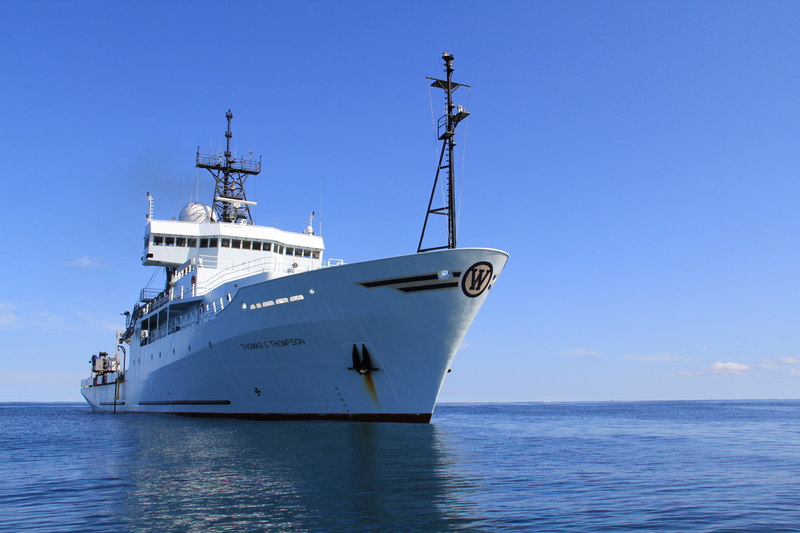 From a shipping port in Taiwan, the research vessel Thomas G. Thompson set out on a two-month voyage to study air and sea interactions and their impacts on the Southeast Asian monsoon season. Aboard the vessel, a crew of international collaborators used a robust set of instrumentation to capture everything from oceanographic measurements to detailed atmospheric observations. The study, called the Propagation of Intra-seasonal Tropical Oscillations, was designed to better understand the turbulent conditions over the Philippine Sea and to improve regional forecasts by learning more about aerosols (like pollution) and how they interact with clouds to form convection. 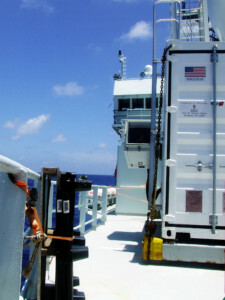 “Space Science and Engineering Center scientists and engineers contributed to the ship’s instrument fleet by building a portable research lab, called the SPARCLET. Its purpose is to provide a climate controlled and hardened portable lab that can be easily shipped and deployed anywhere in the world,” says Bob Holz, SSEC scientist and collaborator for the PISTON campaign. The SPARCLET is a downsized version of the original SSEC Portable Atmospheric Research Center, a 17-foot towable laboratory used to make land-based atmospheric field observations. The SPARC carries two primary instruments designed and built at SSEC: The High Spectral Resolution Lidar and the Atmospheric Emitted Radiance Interferometer. The SPARCLET is designed to also support both instruments, but for the PISTON mission, was fitted for the HSRL. 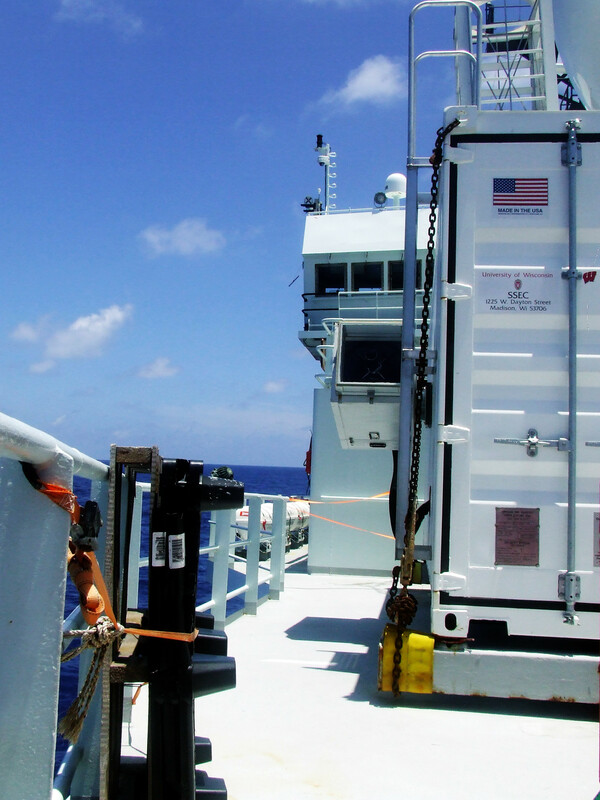 To accommodate the maritime mission, SSEC engineers built the compact structure to house the HSRL using a standard metal shipping container used to transport goods worldwide. Engineers modified the SPARCLET “seatainer” which included insulation, adding temperature control, and mounting the HSRL to withstand the 22,000-mile journey while making it readily deployable from a ship’s deck. The HSRL was first developed at SSEC nearly fifty years ago by Ed Eloranta, a scientist at SSEC and is capable of continuously measuring and resolving thin aerosols and clouds. Pollution like exhaust and smoke are found in high concentrations over the Philippine Sea and can impact weather through convective processes and cloud seeding. According to Holz, collecting accurate aerosol data is crucial to understanding the atmospheric conditions in the region. 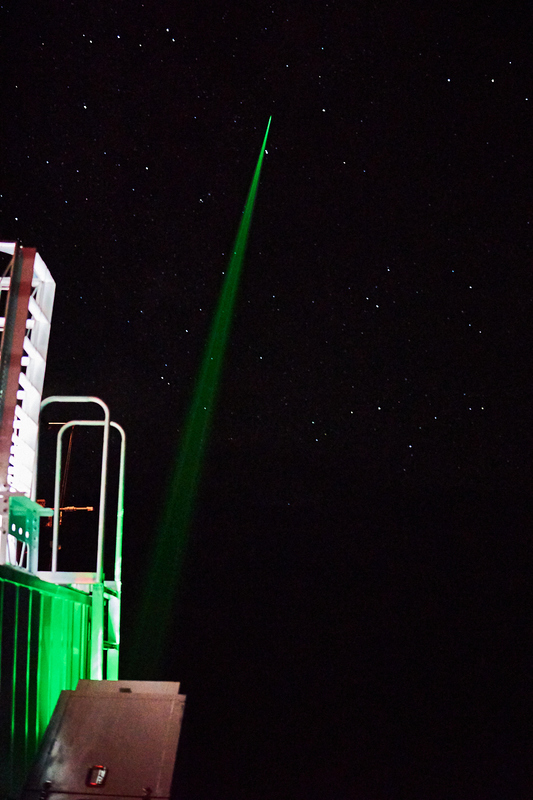 Eloranta’s lidar system is one of the only lidars in the world with the required measurement sensitivity and capable of deploying on a ship. The experiment ran from mid-August to mid-October 2018 and was designed to observe conditions during the boreal summer intraseasonal oscillation, a seasonal variation in the Earth’s atmosphere that impacts different regions around the world. The topic of aerosols is of interest to researchers due to elevated levels of pollution coming from mainland areas like the Philippines. As the crew collected data over the course of several hundred nautical miles, twice they were rerouted when tropical cyclones passed through their area of operation. Despite the disruption, however, the passing typhoons presented an opportunity to collect more data. “The resulting ocean churning from the storm gave us a chance to observe the air and sea conditions in its wake,” says Coda Phillips, a University of Wisconsin–Madison graduate student in the Department of Atmospheric and Oceanic Sciences. Phillips was part of the deck crew for one month of the journey and operated the HSRL for daily measurements, as well as collecting particle samples. He says like many field campaigns, the conditions they observed were not as extreme or dynamic as they can be in the region, but the experiment was able to capture good observations of a suppressed phase in the inter-seasonal oscillation. Following the end of the PISTON field campaign in October 2018, the SPARCLET began its journey back to Madison, Wisconsin with the data now being analyzed by Holz and his team. The PISTON project is a part of a larger NASA mission, the Cloud, Aerosol and Monsoon Processes Philippines Experiment, designed to understand cloud, aerosol and monsoon processes around the Philippines. During the next phase of the CAMP2Ex mission, Holz and his team will deploy an updated version of the HSRL to the Philippine capital of Manila. While there, ground-based instruments will provide validation measurements for weather satellites and high-altitude aircraft instrumentation. This research was supported by SSEC, The US Office of Naval Research and NASA.